Seacoast United has provided opportunities for youth soccer players through the age of U20 for over 22 years, and is now able to offer that same opportunity to collegiate and post-collegiate players looking to further their development during the summer months. The addition of the Seacoast United Phantoms minor league teams to the Seacoast United development pyramid will create an environment for both players and fans matched by very few organizations in the United States. 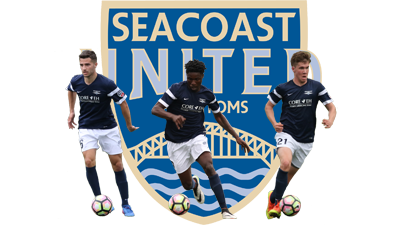 “Our aim is to continue to follow the Club’s philosophy of utilizing players who have come through our successful youth system and open doors for other players within New England,” said Iain Scott, Director of Coaching at Seacoast United. The PDL team earned a berth in the Lamar Hunt US Open Cup for the first time in franchise history in 2015, advancing to the 2nd round. They finished 2nd in the Northeast Division, losing an overtime heartbreaker 2-1 in the divisional playoff in May 2016. 2017 saw the PDL squad win the Northeast Division crown and advance to the Eastern Conference Semifinal. The NPSL team narrowly missing a playoff berth by 1 point in the Northeast-Atlantic Conference (2016). The WPSL side qualified for the East-Northeast Division playoffs for the first time in franchise history (2016). The Phantoms will play 7 home games at Seacoast United Sports Park in Amesbury, MA during May, June, and July 2019. Schedules are being finalized and will be available by April 2019. The Phantoms will be promoting all of their home games within the Seacoast United youth soccer teams, all of the local travel and recreation soccer programs, and the Greater Seacoast community including Maine and Massachusetts. Seacoast United enjoys a wonderful relationship with the local soccer programs and for 2019, the Phantoms anticipate building upon the great fan support from the 2018 season.